A few days ago I was reading a blog post on ProBlogger. It was written by a Guest Writer & one sentence mentioned by him attracted my attention. It read “Content is King, but unseen content is useless”. That sentence is 100% true. Without proper promotions your golden content would be nothing more than just crap. So promoting blog posts is absolutely necessary & it’s important to do it in the right way. Your Blog may rank well in search engines, but along with Organic traffic your blog does need some referrals from Social Media or Blogging Community sites. Now you would ask why. The reason for that is, today there are millions of blogs which are active in the blogosphere out of which hundreds or thousands have already created a benchmark in our minds. So the competition is pretty much on the higher side & to compete with those big names (blogs) you need your visitors i.e. blog audience to be strong and active. You cannot rely on just a single traffic source in the form of search engines. Recently due to the Panda Effect, blogs who were receiving majority of their traffic from search engines received a huge set back. Many bloggers even lost faith & took a break from blogging. Some bloggers did give up. The ultimate solution to this is either you start producing quality content & build quality links to rank well in search engines OR you engage well with your fellow bloggers who are active in the blogging community. So what I’m going to do is, list down a few DoFollow Blogging Communities which will not only help your blog posts to rank well in SERPs but also attract some new visitors. If your Blog is all about Blogging Tips, Social Media & SEO Tips then there is no place better than Blog Engage (BE) to promote your blog posts. It is the most active Blogging Community owned/founded by Brian. I submit all my blog posts there & it does fetch me some traffic. The more important thing is that, with Blog Engage you are able to Engage with other bloggers in your niche. Last month, Blog Engage added the Chat function and Chat room powered by Comet Chat. I quite like the addition of the chat & the chat room feature, because the latter can also be used for requesting Blog Engage Votes, Stumbles, RT’s & Likes. Blog Engage also allows AdSense Revenue Sharing. So don’t forget to add your AdSense pub ID while filling your profile. BE is now a Invite only site. So if you wish to join, then drop me a comment and I’ll Invite you using your Email ID. Unlike Blog Engage, Indiblogger is dominated by Indian Bloggers. Also, it’s not the best place for submitting ‘Blogging Tips’ like posts. But for HowTo’s & Technology type blog posts it’s the best one to submit to. In the early months of this blog, I used to write more on Technology & with that I had got lots of vote ups from Indiblogger. I was nearly going to win a content there, but finished third or forth at the end. The only drawback I find in Indiblogger is that, it doesn’t provide widgets. If widgets are introduced, then I’m sure it will become a hyper active community as visitors will be able to directly vote up our blog posts. Blokube is very much similar to Blog Engage in terms of scripting. But when it comes to the Categories, Blokube focuses more on niche topics like SEO/SEM, Marketing, Entrepreneurship, Blogging,etc. It is owned by my friend Devesh Sharma who is also a blogger at TechNShare. Blokube was started by the end of 2010, so you’ll find it to be a bit less active as compared to the other Blogging Community sites. So, if your blog revolves around those niche topics, then you need to make it a point to submit your posts to Blokube. As the name suggests, MMOSocialNetwork is a Blogging Community site where you can submit only Make Money Online (MMO), Blogging Tips and Social Media related posts. So if you’ve just written a post related to Approved AdSense Account or Infolinks Related Tags, then submit it and you’ll get a good number of visits from there. MMOSocialNetwork was started in the early part of 2010. It is owned by Hesham from Famous Bloggers. Like Blog Engage, even MMOSocialNetwork allows AdSense Revenue sharing. So you can actually earn some money by submitting some quality posts. It is a Blogging Community Site which deals with all the Business topics, Social Media, Marketing Strategies, PR & a bit of Technology Resources. So submit to Bizsugar only if you’ve a business or marketing related blog. The activity at BizSugar is pretty good. So expect some vote-ups & unique visits after submitting a nice post. 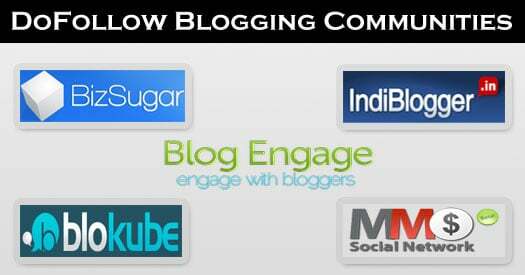 I haven’t listed all the DoFollow Blogging Communities as you can’t submit your blog post to every community. It is pretty time consuming. Remember, the thumb rule of getting vote-ups in the above communities is to remain active on each of them. Don’t just submit your posts there, but also vote-up other’s posts. I hope you enjoyed this article & it will help you getting more traffic to your blog posts. So do you submit your blog posts to the above mentioned Blogging Communities ? If no, then which other sites you prefer to submit your posts ?? Those are my favorite blogging communities although I’ve found out a lot of others recently. I see that BlogEngage and BizSugar are the best sites whereas MMOSocialNetwork seems not to be active like before. Very good artical for those who are blogging on their own legs. These will give them support. And as I am one of them I am requesting you to join me and give some support to do some helpful for others. And thanks for very informative artical. So true… Unseen content is totally useless. Blog promotion is an important step if you want to get noticed. Thats a great list you jotted. Did you forgot to mention SERPed and BlogInteract??!! These look pretty good. Blog Engage is still as happening as always! The others are also good blogging community sites. Thanks for the sharing! Very interesting. Pretty much all the same format. I’ve tried BE and BizSugar, I did well with BE for a while then Brian kinda vanished. Haven’t really had time to go back since. Thanks for this sites 🙂 Inadian Social Bookmarking Sites Going Great!! Hey can u send me a blogengage invitation?? And thanks for the list of communities. I am working with a few, but not yet checked BizSugar. Thanks for the information. Can u send me a BlogEngage Invite. Thanks for sharing this post. I am a user of BlogEngage, Blokube and Indiblogger.Blogkube worked well for me. It send me a lot of visitors and I was able to get in touch with fellow bloggers. IndiBloggers was not that effective for me. Nice post. Have heard about many of these but not all. will give others a try too, for sure. Its Nice But The Page Rank Really Increase By Using It? I was just using one community Indiblogger. Let me try others. 🙂 Thanks for sharing. It is always better to post comments on do follow blogs as these are very useful for the inclusion of your site in the search engines. If you leave your website’s link with the comment on these blogs, the chances of your website getting indexed would be more. Thanks for sharing such a wonderful, Dofollow list. i need a blogengage invitation mate it will be helpful if someone send me a invitation. Sent the Blog Engage invite to you. Hi, Thanks for sharing this information. I would like to have an invite for blog engage. Thanks for the community you mentioned in your 4 and 5 points. I didn’t have the link before i read this article on your blog. I have been successful in applying all four except #4 MMOSocialNetwork. It does not allow me to register. Could you please help? Try contacting MMOSocialNetwork’s admin.Or try registering after some days. There might be a temporary problem. Awesome. Can you send me the Blog Engage invite please? Thanks a lot. Sorry Guru, but Blog Engage is now a One time pay to Register like Community. The fee is 29$. nice post and it is very helpful for me. i think blog engages is the best ..
good post nice post i have submitted my blog to indiblogger because my niche is technology and how to. thanks for the info i have been looking for places to submit to. Thanks for the great article, Mani! I’ll be sure to check a lot of these social submission websites out! Our team has recently launched Tiltzero, a social bookmarking community created with a lot of love and hard work! Check it out at http://www.tiltzero.com/ and if you like it, please add it to your articles! thanks for your share sir, this is the great post.. i’ll chek and try it all..
DoFollow blogging sites is also what we should chose to put our contents into. DoFollow links are easily crawled by google bots and therefor it is indexed faster than of nofollow. This is a Very Nice article, Thanks for Posting . Keep update a more article.Thanks for sharing the knowledge. Hi to every body, it’s my first visit of this web site; this blog carries remarkable and really excellent stuff in support of readers. I’m really enjoying the theme/design of your website. Do you ever run into any web browser compatibility issues? A handful of my blog visitors have complained about my blog not operating correctly in Explorer but looks great in Opera. Do you have any ideas to help fix this issue? Wonderful post & this post is higher your visitors. I almost never comment, but i did some searching and wound up here 5 DoFollow Blogging Community Sites to Submit your Blog Posts. it’s allright. Is it simply me or does it look as if like a few of these remarks appear as if they are left by brain dead folks? 😛 And, if you are writing at additional online sites, I would like to keep up with anything fresh you have to post. Would you make a list of all of your social pages like your Facebook page, twitter feed, or linkedin profile? Thank you for the useful information with short descriptions. I would like to ask one thing i.e. How to find whether a blog is dofollow or nofollow? I have a blogger blog http://fortune86400.blogspot.in. If not, How to make dofollow? Thank you in advance and keep smiling. By default blogspot blogs are nofollow. Also it is difficult to find whether the links are nofollow/dofollow without actually checking the links anchor. I tried, but couldn’t find any links in the comments section. I was suggested this blog by my cousin. I’m not sure whether this post is written by him as no one else know such detailed about my difficulty. You’re amazing! Hello Mani – This post is what i was actually looking for. Very informative and gives me the exact amount of info i need. I hv registered in some of those forums, I am looking to improve my alexa rank and build good quality traffic to my website. Can you please send me an invite to BlogEngage. Thanks. I just went out to blogengage.com, I think it’s a premium blogging platform network. No you can also get free blogengage account worth $19..but you need to promote them. Really! this is a informative and useful words of the post. I appreciate it. I do have a blog and I wanted to join blog engage. Can somebody send me invites? thx for sharing. can somebody send me an invitation? Thanks for this list dude. I owe you. You are doing a great work. These lists are really helpful. Nice article. Really help me. But some of the site Exhausted. You should update your site. Great list to send articles. Though Indiblogger has highest DA among the list. Clear, easy to follow step by step advice for successful blog writing. Content has always been, and always will be king from the beginning of the Internet until the end of time 😉 Really though, it’s all about the information. Thanks for this great blog post about writing great blog posts. Tells me that you probably DO know what you’re talking about.